This spaghetti looks like your ordinary spaghetti but this dish taste like the spaghetti in fastfood joints, saucy, slightly sweet and geared to Filipino taste. There is a saying that don’t judge a book by it’s cover like this spaghetti that looks ordinary but the taste is superb. And with regard to the Italian seasoning, if you can’t find it in big supermarkets, you can make your own. Just mix equal amount of basil, marjoram, oregano, rosemary and thyme then grind it in a food processor. 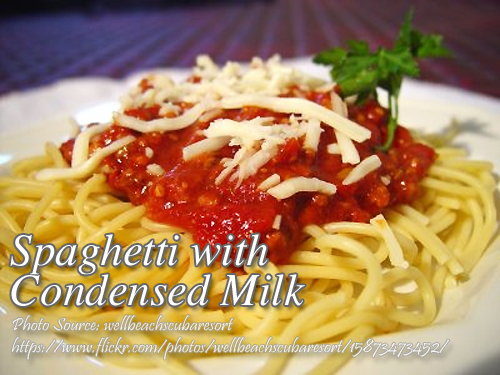 To cook spaghetti with condensed milk; In a heavy saucepan, heat oil and saute onions until transparent. Add garlic and saute until light brown. Add ground beef and stir cook until brown. Pour in spaghetti sauce, hotdogs, bay leaf, and Italian seasoning. Simmer, about 5 minutes. Stir in condensed milk. Mix thoroughly. Remove from heat. Toss with cooked pasta gently. This spaghetti looks like your ordinary spaghetti but this dish taste like the spaghetti in fastfood joints, saucy, slightly sweet and geared to Filipino taste. In a heavy saucepan, heat oil and saute onions until transparent. Add garlic and saute until light brown. Add ground beef and stir cook until brown. Pour in spaghetti sauce, hotdogs, bay leaf, and Italian seasoning. Simmer, about 5 minutes. Stir in condensed milk. Mix thoroughly. Remove from heat. Toss with cooked pasta gently. Serve with toasted bread or garlic bread. Hi, thanks for sharing this delicious spaghetti. I’ve tried it and my kids love it. Hi Fely, I’m happy that your kids love this spaghetti dish. Hi Nini, Sorry for the typo. I corrected the recipe already. Thanks for your feedback.